Almost a year ago Atlanta was shocked by the news that 11 year old Dunaire Elementary School student Jaheem Herrera had hung himself with a belt in his bedroom. It was a shocking scene to imagine, his mother and little sister discovering the body. Even more shocking is the realization that this young man was likely driven to take his own life by the constant bullying he experienced while at school. Jaheem's mother, Masika Burmudez, had complained to the school eight separate times with no results. Apparently young Jaheem just stopped complaining about it after nothing was done. It's also rather surprising how the Dekalb school system chose to deal with Masika Burmudez after the death of her son. One would think a principle, a school board member, or any other person of conscious would have an absolute open door policy with a mother in her situation. Dekalb County basically refused to meet with Masika, and they also deny any wrong doing to this day. Bullying is basically the use of strength or status to infringe on someone else. While it is shocking to read about the recent wave of elementary age kids committing suicide to escape their tormentors, the fact that bullying in general is on the rise is sadly unsurprising. Children are like little sponges, soaking in all that they see and hear around them. This information is an important part of human development. Even though sharing, self sacrifice, love, and tolerance are often talked about as values to strive for in our lives when, we look at those that lead our nation through the political process or through status in the market we see very different guiding principles in practice. If there's anything that our culture teaches through action it's that we are committed to the use of force and status as a means to assert our will. In fact it is the systems of violence that our government puts it's highest economic priority, not diplomacy, not peace, no programs of social uplift. For example, we spend 59% of our federal budget on the military industrial complex, while only spending 4% on education. In Georgia we spend much more on each prisoner(by the way Ga has the highest percentage of citizens in the prison system per capita in the US) then we do on each student. These policies are created, supported, and perpetuated by the folks we call leaders. They system we live in today, more then ever, almost forces children to confront their peers not with cooperation and collaboration, but with conquest and competition. It's no shock that young people may see publically destroying someone else's self worth as a legitimate means to build their own social capitol. It seems that it would be abnormal to perceive the realities of the global system we exist in today and value concepts like sharing, compromise, peace, and fairness even though those values do seem to come naturally for humans. Let us imagine a system that not only provides lip service to peace, justice, and equality. Let us imagine a system that puts policies into practice that prioritize these principles. Let us imagine a system that creates an environment of love, friendship, and safety for young people like Jaheem Herrera to thrive in. Masika Burmudez and the folks at ABC are planning several events to around the anniversary of young Jaheem Herrera's passing, we will be there. 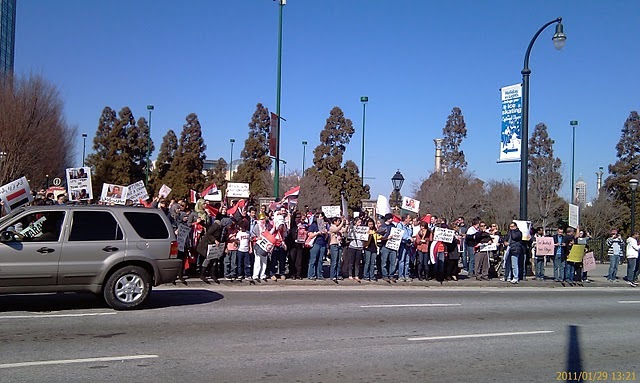 Today around the country, around the globe, demonstrations in solidarity with the people of Egypt took place and Atlanta was no exception. 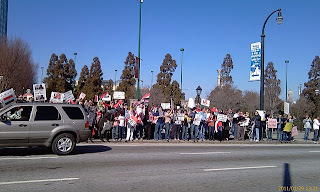 Just days ago several Americans of Egyptian decent banded together to organize a demonstration outside of the CNN center. None of them had ever organized anything like it in the past. They had no experience writing press releases, sending them out, developing talking points, the legalities of holding a street demonstration, but that didn't stop them. Over the course of just days this small group of passionate folks built a rather impressive, lively demonstration that drew out around 250 people and was covered by CNN, CNN Espanol, The Atlanta Journal Constitution, Atlanta Indy Media, several local TV stations and more. We stand in Solidarity with the courageous Christian, Muslim, and Secular Egyptians fighting side by side for their democratic right to end a totalitarian government. President Mubarak’s government has been in power for the past 30 years. It is plagued with corruption, failing economic policies, fraudulent elections, selective enforcement of the rule of law, and police torture. Egyptians paid a heavy and now they are asking for their basic rights. The Egyptian demonstrators are demanding the right to free speech, fair elections, and equal opportunities. As Americans, we ask our government to stay true to our principles and support the Egyptian people and NOT the government of Mubarak. We are concerned for excessive human right abuses, and violence taking place NOW in Egypt. The People Have Spoken and by supporting them we will stay true to our American principles of democracy and our interests, because a democratic society is a peaceful society. Many in the crowd had direct connections to those that are in Egypt right now and fear for their loved one's safety. There was a mix of excitement over what seems to be an inevitable, seemingly spontaneous revolution, and concern for the clear human rights violations of the Egyptian government. Since the internet and cell phone blackout in Egypt yesterday there have been reports of escalated violent clashes between protesters and police in Egypt, but there have also been reports of police officers laying down their weapons, refusing to fight their own communities, even joining the demonstrators. AFSC's official statement on the unfolding situation in the Middle East and Africa came out Friday, "AFSC staff in the Middle East and Africa are following the news regarding the wave of demonstrations across the region. We add our prayers to those of many others around the world that there is no further loss of life. We also encourage those in power to listen to the young people who are expressing their aspirations and welcome their role." 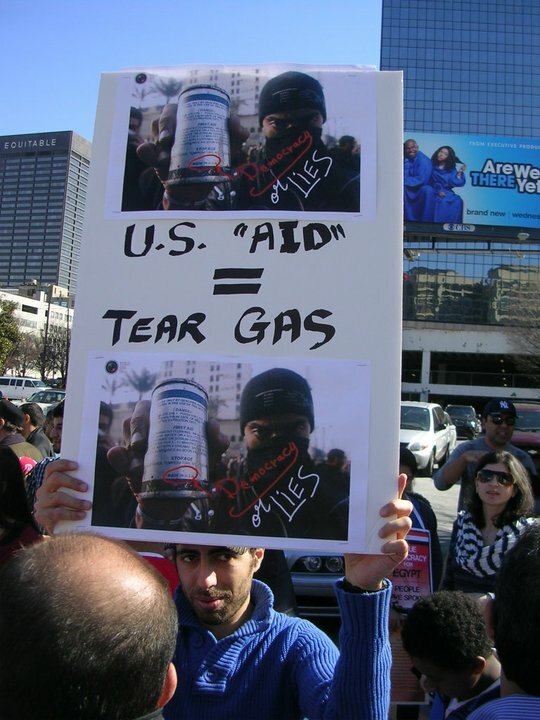 Locally, here in Atlanta, we're excited to continue to work with and support the folks that organized today's rally. While one can not predict the conclusions of what has begun in Egypt, it is exciting to witness workers, students, and others demanding a fairer, more just society. It is exciting to see everyday people standing up to their government and demanding the right to self determination and rejecting governance which can only be forced upon a people by the barrel of a gun or tyrannical economic policies. It's exciting to be in Atlanta today, and be able to add our voice to the global choir....which seems to be getting louder. Can you hear it? SCAP Teams Up With GLAHR!! "If I Had A Trillion Dollars" Contest Winners!! Marching for Public Education on King Day! Georgia Students Prepare To Resist! Youth Inspire AFSC staff in Lagrange Ga!